The child’s parent, Ledelldra Brooks, says she made an unannounced visit to her child’s special education classroom at Viking Elementary School in May and found her daughter in the cage wearing a soiled diaper. Brooks called the police and has since obtained a lawyer and filed two claims against the teacher and school administrators. 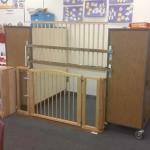 The cage consisted of a toddler gate and a crib gate attached to bookshelves, a photo shows. When officers arrived, they dismantled the cage and interviewed the aides of special education teacher, Teresa MonPere. Police forwarded the Fresno County District Attorney’s Office as a potential case of misdemeanor child abuse. But, no charges have been filed, and no arrests occurred. Fresno Unified School District placed MonPere on administrative leave, but she is now working at a different elementary school, she said. “Dropping in on a class…..” seems to find so much bad stuff going on. We think it never happened with our kids but back then we were all working like crazy and just happy when they came home after school (of age of course). That little cage (enlarge it) was carefully crafted and appears to have been used for some time. Somethings not right with this whole story. Get ready to open the pocketbook Fresno! The lawyer must be foaming at the mouth – False Imprisonment, negligence, intentional infliction of emotional distress. The teacher will be lucky to avoid arrest. Sad situation for the child, the parents, and yes the teacher who is obviously not professionally equipt with either the training or resources to handle this particular case. Need more information regarding circumstances and capabilities of the child to make an informed opinion on this one. The child is special needs. Does she act out putting other children in harms way? Does she take off out the door? Maybe that area is a safe spot for her, where the teacher realized the student felt more comfortable? We just don’t know. When I take my 2 year old grandson out, I have a back-pack with a lead on it. Why? he, like most 2 year olds loves to run! He runs faster than me! I know no harm can come to him when he is wearing the “kid leash”. I have been accused by “probably non parents” that it is cruel, yet what is Cruel is to allow him to run free in public possibly in harms way! This is a special needs child, we have no idea why the teacher thought to put her in a “caged” area. Like Slobird, I want the whole story first. IF this were a “normal” classroom and the teacher had “caged” a “normal” student, do you think you the reaction would be the same…or might there be a bit more outrage? Of course not, but we are not talking about a “normal” child here. No apples to oranges comparison Pelican. I know of an autistic kid who prefers to be in a closet rather than in the open area of the living room. Is that cruel to allow it? Is it cruel to put babies in play-pins? We don’t know what level this child is at? She is 7 but what is her age level? A 7 year old with disabilities could be at an age 3 level. For a normal 7 year old, the child would rightfully protest being in there I am sure. But for a 7 year old at real age 2 or 3? They might be comforted? What is wrong here that I can agree on with Mary, is that the parents should be been part of the plan to contain the girl. Obviously the teacher thought it necessary. The parent should have been part of the plan for her daughters daily care/activity for sure! That is the part I find MOST disturbing. What is MOST disturbing is that ANYONE would think that caging ANY child is appropriate. When you’re done, come back and tell me that there are times when caging a child is appropriate. The school had the cage option as allowed per their policy and procedures document. Even then, the parents should have been notified of the decision to cage their child. Wrong! NO cage is appropriate…period. The teacher should loose her credentials. I taught special education for 10 years in California–there is no reason for a child to be caged. That is a teacher who is not skilled at what she needs to manage in her room. That is a teacher who does not intend on teaching all children that walk through her door, the very tenent of public education. Why is she still teaching??????? You should all ask yourselves this question. SLOBIRD, I agree with you that teachers are asked to do too much at times, however, that is the nature of the career and if you can’t hack it, you should leave. All children deserve an education, do you think the 7 year old locked in a cage was getting an education????? Obviously, the teacher is a complete nut job who should have her credentials revoked. The ‘No Child Left Behind’ model requires states and school districts to ensure that ALL students are learning and are reaching their highest potential. Special education students should not be left out of these accountability mechanisms. All of you who disliked my post clearly do not understand what it means to teach a child. It is never appropriate to put a child in a cage in the classroom. A teacher’s job is to teach, not to restrict access to an education and that is precisely what this teacher did. Anyway you look at it, if you think it is okay for a child to be placed in a cage, you are not right in the head. Regardless of who the quote is attributed to, it’s true as well as profound. I want to be open about this and many other situations. I really believe we have major problems regarding our teachers. Teachers today have special needs children, non-speaking English students, behavior issue students, drugs (yes, even at age 7), and then there are the parents, constantly changing learning programs and techniques. I personally think we can too much of our teachers, and if lucky, with an aide. I will wait and hear the whole story on this. The teacher should be caged, and her tenure revoked. are you a parent Pelican? As a matter of fact I am. I just happen to have a child (now grown) with special needs (Down Syndrome) who went through the educational system and even was awarded the Golden Tiger Award while at SLO High School. She is an outstanding human being and an excellent example of the success of mainstreaming. I asked the teacher why she was siting in a swing. She said, because she likes it. I ordered the teacher to remove her from the swing and demanded a meeting to discuss her IEP. It was a classic example of the teacher babysitting rather than educating. It NEVER happened again. Educators have a moral responsibility to their profession, special-ed or not. People with special needs are all different, and all have unique requirements. This is part of the curriculum for student teachers entering the special ed. field. There no room for teachers that can’t take the heat. I know where of I speak. I too have a special child and have taken the time in class to review his needs. Yes improvements were made and more parents should visit their classrooms. Having a special needs child requires parents to step up to the plate, I never feel like I did enough regardless of what I’ve done. We get one chance and the institutions know that the few agressive parents will soon be replaced with laid back parents.